Get Affordable Dentures at Our Commerce Twp Dental Office. Call Today! If you are missing teeth, dental dentures offer an incredibly effective solution for helping to restore your natural smile. Not only do missing teeth cause discomfort, then also can create functional and aesthetic oral problems. Dentures can be your best option to avoiding sagging facial muscles, limiting speech, and avoiding certain foods. Even if you have lost your natural teeth from periodontal disease, injury or tooth decay, dentures are a great option. Dr. Sedki can provide a natural-looking set of dentures for a beautiful, confident smile. 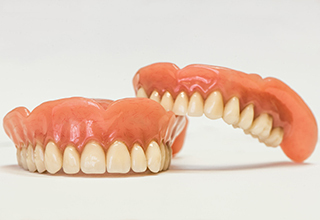 When considering dentures, there are two types, complete and partial dentures. Complete dentures are used when all teeth are missing. Partial dentures on the other hand, are used to fill in spaces from missing teeth when some of your natural teeth are still in place. Further, partial dental dentures help to prevent other teeth from moving. In both cases, dentures resemble your natural teeth and are made to significantly enhance your smile. Are you considering dentures or do you need to fix / update your existing dentures? Our dental practice in Commerce Twp, MI can help to improve your smile and oral health. You can feel confident that we will design your new dentures for the best possible comfort, look, and feel you have always wished for. Call today for an appointment! Although dentures are extremely durable, they will not last forever. However, you can expect your dental dentures to last for several years. During this time, you may need adjustment due to normal wear. In some instances, your dentures may even need to be remade. Over time, dentures become porous and as a result may house harmful bacteria. In some cases, side effects can occur as they age including headaches and resorption of the gums. Regular visits to our dental practice, will ensure that we extend the life of your dentures and help you maintain a healthy natural smile. Do You Need Partial Or Full Dentures? When adjusting to your new dentures it is normal to experience, increased saliva flow, some soreness and irritation. As you become adapted to your dentures, these concerns will quickly diminish. During the normal process of acclimating to your new dentures, you can expect to visit your dentist a couple of times for minor adjustments. Your comfort will return as your muscles and tissues strengthen and accept your new dentures. Our local Commerce Twp, dental practice is experience and trained to provide the best possible care. We educate all our patients for their new dentures. Similar to all dental treatments including; bridges, fillings and crowns, dentures require good oral hygiene. To ensure your healthy mouth, regular dental visits are required. Proper care for your dentures include removing them overnight. Always place your dentures in a covered receptacle. Your denture receptacle should be filled with a soaking solution recommended by your dentist (warm water can also be used). Extended exposure to your dentures can cause them to become brittle and discolored. Find more out about denture care by contacting our Commerce Twp dental practice today! Our general recommendation is always for our patients to use soft bristle tooth brushes, and use the recommended paste. This is especially important for individuals with dentures. When brushing always try and cover all areas of your dentures, after every meal. Always try and brush between your teeth and gently brush your gums and frequently rinse your mouth. In addition, we suggest our patients stimulate the circulation of your gums by massaging your gum tissue with your dentist recommended tooth brush. By following these simple procedures, you will greatly improve the oral health of your mouth by removing damaging bacteria from your mouth. When chewing your foods, always begin with soft foods that can easily be chewed and cut into small pieces. Eating will take some time and practice, as you should chew using both sides of your mouth. You quickly will be able to add a bigger variety of the foods you enjoy and return to your accustomed diet. Always be careful with hard foods, especially during the acclimation process. Do not be concerned if pronouncing some words requires practice. At times your dentures could slip when you cough, laugh or even smile. Always try and re-position them be slowly swallowing as you bite down on your dentures. Always consult our dental office if speaking problems persists. As with any dental treatment, thorough dental exams are recommended. It is important to ensure the tissues that support your dentures are healthy. When considering dentures, make sure to choose an experienced dentist. Dr. Sedki has been helping patients for over 15 years, with dental treatments including: crowns, bridges, and fillings. You can also find more information regarding dental health at mouthhealthy.org.